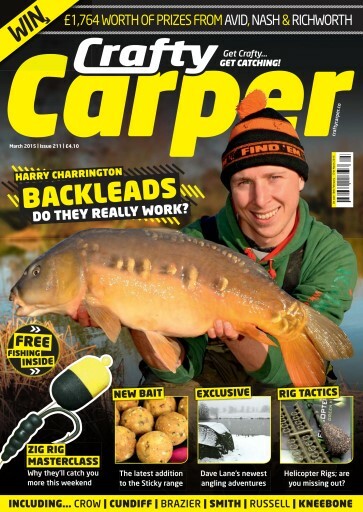 In this issue of your favourite carpy reading you can expect to be well and truly inundated with information, ideal if you're looking to up your game in the Zig fishing stakes, see if backleads are a thing of the past, make the most of a short time on the bank, find out all about the inhabitants of the famous Wraysbury, see how Dave Lane is getting on over on Bundy's Pit, learn about the effects of bait contamination or if you just want to know what our man Jules has been upto over the last two months. Charley Bunce also tells all about an epic work placement she took part in over in France on the Abbey Lakes Complex. There's loads of prizes from the likes of Avid Carp, Richworth and Nash and if you want to be the king of carpy cool on the bank then you're in luck as we've got hold of some of the carpiest items of carp angling gear you may have laid eyes on, bring out the DPM camo.